It's funny to watch things go viral, even just a little viral on the Internet. Here's what happened, but more importantly, we'll talk about the code. Let's also make it complete clear that Jeff Key rocks. See picture at left, in between his two "lame" creations." For years Jeff has lived the mantra "Talk is Cheap, Show Me the Code." And he does, with some of the most inspired little .NET-based utilities out there asking for little else but our undying admiration and gratitude. That is how Jeff rolls. I visited his CodePlex site and saw it had 11 downloads. 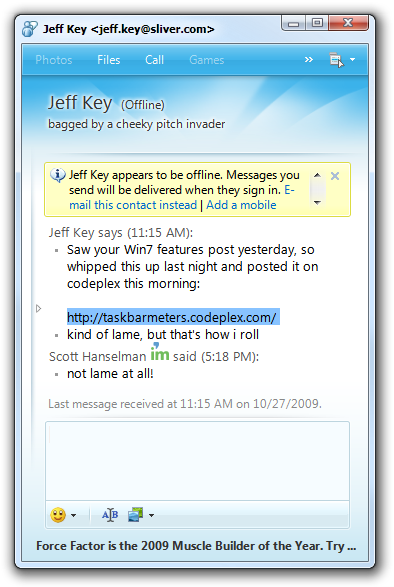 Why would Jeff be so down on himself and say the code is "lame" when clearly people were (are) going bananas and downloading these little utils? Well, because it's so darn easy to do, this was likely the source of Jeff's intense guilt. ;) The Windows API Code Pack makes it easy. ASIDE: In fact, WPF on .NET 4 makes it even easier because it includes the new TaskbarItemInfo class that lets you do this from XAML. Pete Brown from my team has a great write-up on Showing Progress in the Windows 7 Taskbar with WPF 4 on his blog. Jeff also adds some JumpLists to launch Task Manager or Resource Monitor on right-click as well. Nice touch! A little polish there. Also easy to do with the Windows 7 APIs in the Windows API Code Pack. Nice job, Jeff Key. You rock. So, Dear Reader, go light up YOUR applications under Windows 7. Enjoy! A day later, @ScottMuc tweeted me about adding a Disk IO Meter and we went back and forth about it on Twitter. He eventually submitted a patch to CodePlex. While Jeff hasn't updated his code with that patch (maybe he'll make me an admin and I can do it), I'm able to patch my local copy, of course. Thanks for stepping up and putting in the patch -- I didn't see it. Just like that one time when we were hiking in the Andes. The memories! Nice app, Nice Article and thanks for the patch. Heh, the funny thing is that I wouldn't even bothered trying if you didn't simply give me that little nudge on twitter! Thanks for the mention. 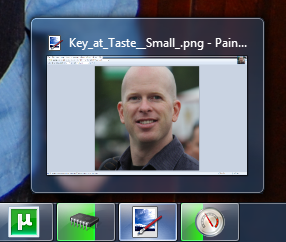 OT: Scott, is there any place where I can give feedback / file bugs for Windows 7 RTM? This is pretty cool and relatively clean IMO given that it's not built in. Still excited for .NET 4.0's wrapper classes. MS shouldn't have hidden away the notification area in 7 - it was useful for this sort of thing, e.g. a minimized Task Manager instance. Still, a good example of coding for Win7 in .NET. 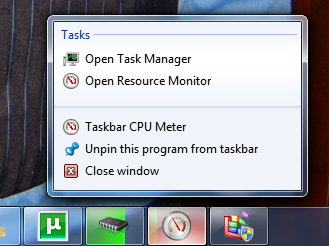 I get nothing when I right-click on these, so I can't pin to the taskbar. Do these have to live in a certain folder?